Ever since I was a teenager running track in high school I’ve been fascinated with how to manipulate the human body to perform better. To me it was like a video game – you could literally level up your character if you did the right things with your strength and conditioning program. That fascination led to a career as a strength coach and eventually to becoming the first coach to focus exclusively on mountain bike strength training. Of course, that choice was a selfish one since I wanted to find the best ways to help me ride faster and longer on my bike and helping other riders seemed like the best way to do it. And while I can’t ride quite as fast and as long as I used to – injuries and time catch up with us all – I’ve never lost that fascination with how to use training to “level up” my character as much as possible. Over the last few years I’ve been using a lot more Steel Mace and Indian Club exercises as part of my “level up program” and seeing some really impressive results. But while I could feel the results it was hard for me to explain exactly what the difference was between training with a Kettlebell or Dumbbell and training with a Steel Mace or Indian Club. This was frustrating for me because I know that these training tools had a lot to offer mountain bikers if I could just figure out how to explain the benefits in a way they could relate to. Luckily for me the universe tends to put the right people in my path at the right time and I recently heard a presentation that made it all click for me. Now I understand exactly what the difference between these training is and why mountain bikers need the results that Steel Mace and Indian Club training provide. First, to understand this difference you have to look at your muscles as being made up of two basic parts. The first are the muscle fibers, which is that most of us think of as “our muscles”. They are responsible for contracting and creating tension like when you are doing a Deadlift or Squat. The second part is the Fascia. 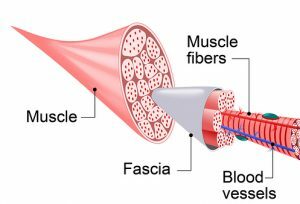 The fascia wraps your muscle fibers, kind of like a balloon with your muscle fibers on the inside. Among a lot of other jobs, the fascia is responsible for helping to stabilize the body. Holding a weight out to the side and holding it there is a good example of this function. So, it is the interplay of Tension and Stability that makes up your ability to perform both on and off the bike. And the types of exercises we use target these two functions differently. Tension is targeted with Compression Based Tension. Compression Based Tension loads are characterized by symmetrical loads that are close to the hands and/ or centerline of the body. A Goblet Squat or a Deadlift are good example of this type of loading. There is a lot of compression straight down onto the muscles and joints from the weight. There isn’t much stabilization needed and so the muscles fibers’ ability to create tension is often the limiting factor. Stability is best targeted with Leverage Based Tension. Leverage Based Tension loads are asymmetrical and/ or have the weight being held far away the centerline of the body. Holding a Steel Mace and doing a Squat or Deadlift is a good example of this. The Steel Mace is only loaded on one end and the weighted ball is far away from the centerline of the body. This forces the body to stabilize the load before it can create tension to lift it. This puts stress on the fascia, which in turn responds by adding collagen to increase its stability. These are two very different adaptations by the body and transfer over differently to the trail. On the trail we need a lot of Leverage Based strength because that is usually our limiting factor, not the ability to create a lot of tension at one time. Building strength using Compression Based Tension won’t transfer over the same way that Leverage Based Tension does. This explains why some riders don’t see as much from their training programs as they would like. The emphasis on Compression Based loading builds the wrong kind of strength, especially in the core and upper body. On a quick side note, this is not the same as using an unstable surface to “train the stabilizers”. This type of training usually just a Compression Based exercise on something like a BOSU Ball and while it certainly makes you have to stabilize more than normal is not the same thing as having to stabilize a Leverage Based exercise. It is the wrong approach to the problem of creating more stability in the system, which is better trained with tools and exercises created for that purpose. Understanding the two types of tension that you can expose your body to and the different results it produces opens up a whole new way to look at “leveling up” your character. Sharing more exercises and ideas to help you train this important element of performance is going to be something I will be focusing more on in the future as I think this represents the next evolution of Functional Training for mountain biking. In the meantime, you can sign up for a free Steel Mace for MTB Workout and get some ideas of how you can use these unique training tools to help you ride with more speed, endurance and confidence on the trail. Great article as usual. I’m using your steel mace exercises in my workouts for some time and really see benefits for my rides. Can you share more thoughts on BOSU ball? I was considering adding some BOSU-exercises to my routines. Is BOSU training worthless for MTB? I won’t call it worthless but I can think of so many other things I’d rather invest in or use my training time doing that it isn’t something I use or recommend. I feel that it doesn’t really help with overall balance and instead develops a specific skill – the skill of standing on a BOSU Ball and doing exercises. IMO it was the wrong answer to trying to train the stabilization factor that we need in sports like MTB.